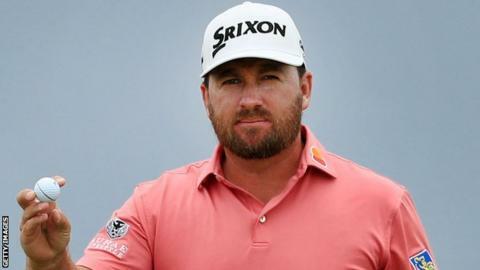 Graeme McDowell will take a one-shot lead into the final round of the PGA Tour event in the Dominican Republic on Sunday after his second straight 64. McDowell, 39, moved to 15 under par after carding 10 birdies in his eight-under-par round at the Corales Puntacana Resort and Club Championship. Now 257th in the world rankings, the 2010 US Open champion will be seeking his first win since 2015 on Sunday. The Northern Irishman heads US player Chris Stroud by one shot. This event in the Dominican Republic is being contested by players who did not qualify for this week's WGC Match Play event in Texas. Stroud matched McDowell's 64 in a round which included an eagle three at the par-five fourth. Overnight leader South Korea's Sungjae Im and Australian Aaron Baddeley are sharing third place, two shots off the pace. Im fired a 69 on Saturday with Baddeley carding a 68. Ireland's Paul Dunne will go into the final day sharing fifth spot on 11 under while his compatriot Seamus Power remained on four under after firing a 72 on Saturday. McDowell's last win came at the Mayakoba Golf Classic PGA Tour event in 2015. The Northern Irishman is exempt into this year's US Open at Pebble Beach, where he won in 2010 but has yet to earn a spot in The Open at his home club of Royal Portrush.